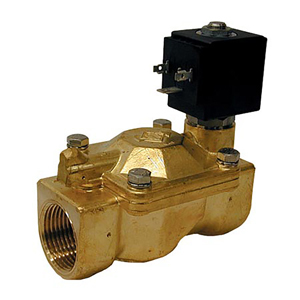 SV6000 Series 2-way solenoid valves are internally piloted valves featuring Brass, stainless steel construction and FKM seal material. The temperature range from -10 to 137°C (14 to 280°F) and FKM O-ring material is ideal for neutral media such as compressed air, inert gases, synthetic oils and water. Buna O-rings are good for compressed air, inert gases, and water. Buna O-rings have a more limited temperature range from -10 to 90°C (14 to 195°F). A strain-relief connector is supplied with each unit. A ½" conduit plug is also available. Buna O-ring: -10 to 90°C (14 to 195°F). Buna O-rings are not recommended for synthetic oils. Use FKM O-rings. To replace the standard BUNA O-Rings with option FKM, add suffix "-V" to model number, add $50 to price.